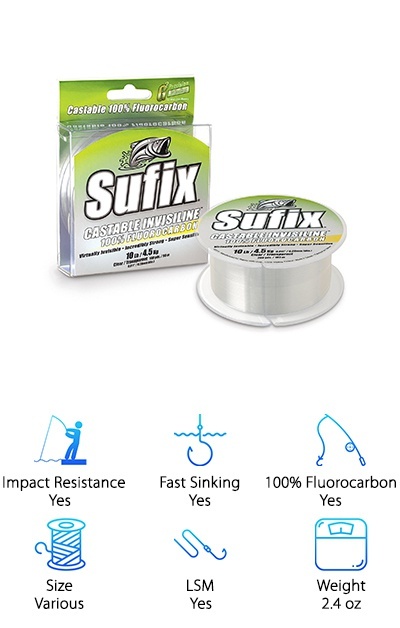 Fluorocarbon fishing lines have a lot of advantages over their monofilament counterparts. They’re water and UV light resistant, practically invisible to fish, and more sensitive, just for starters. To help you find the best fluorocarbon fishing lines for your next fishing trip, we’ve researched some of the best lines out there. Before we get into our fluorocarbon fishing line reviews, though, let’s take a look at some key features. These are the things you need to know when shopping. Impact Resistance - Basically, this is how tough the line is. Think about it: when your line is underwater, it comes in contact with a lot of rough stuff. Rocks. Plants. The tougher it is, the less likely it is to break on you. Fast Sinking - Fast sinking line moves through the water quickly. There’s less resistance, too, which allows it to more effectively get to the bottom of the lake, ocean, or wherever you’re fishing. Fluorocarbon is designed to be fast sinking. 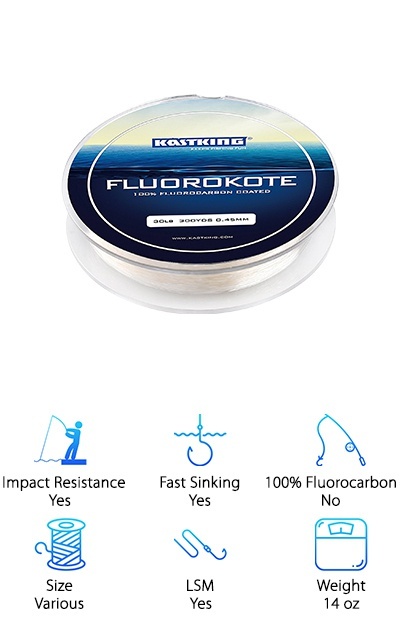 100% Fluorocarbon - Most of the lines we found are 100% fluorocarbon. There are a few that are a combination of a copolymer line with a fluorocarbon coating. These offer the benefits of fluorocarbon with some additional benefits, too. 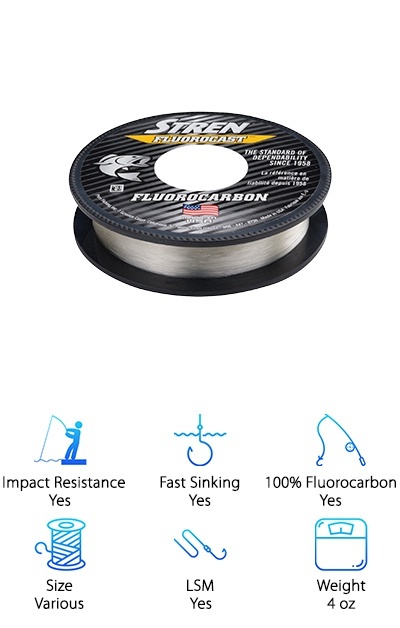 Size - Fishing line comes in different lengths, 25 - 600 yards or more. You’ll see a pound measurement here, too. This isn’t the size of the fish it can handle! It measures how much pressure the line will take before it breaks. Low Spool Memory/LSM - When line is wrapped around a spool or reel for an extended period of time, it can start to lose shape and want to stay coiled. You don’t want this to happen. LSM means it won’t. Weight - For the most part, fishing line is pretty light. Depending on how much you’re getting and how heavy the spool is, weights can vary a little bit. Ultimately, though, you won’t see any that weigh much more than one pound. Using the right fluorocarbon fishing line will make sure you’re able to tell more stories about the big catch you made instead of lamenting over the one that got away. 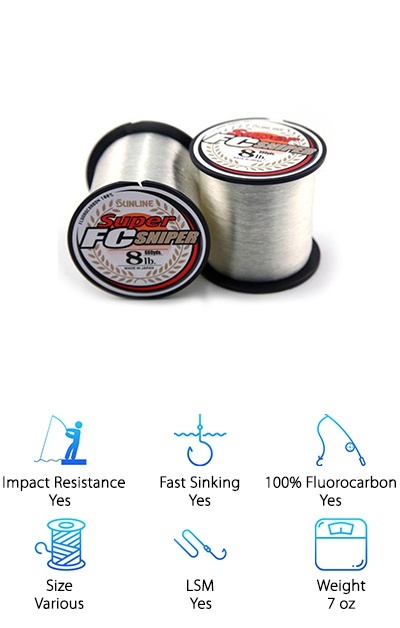 Not that you know what to look for in a fluorocarbon fishing line, let’s get right into our fluorocarbon fishing line reviews. If you don’t have a lot of time to spend, make sure you take a look at our top and budget picks first. Ok, let’s get started! The Sunline FC Sniper has everything you could want in a fishing line - it’s durable, castable, and manageable. Not only that, but it can tolerate a lot of different conditions. You’ll notice how easy it is to work with right from the beginning. When putting it on your spool, it won’t kink or bend, Plus, it’s easy to tie. It’s spool memory is particularly good, you’ll have no problems leaving it on your reel for an extended time. The best part? It’s available in a lot of options, from 5 - 20 pound test in 200, 660, and 1200 yard lengths. And it’s effective in any size. For example, the 5 pound test is the best fluorocarbon line for bass while the 7 pound test is the best fluorocarbon line for spinning reels. If you’re fishing for crappies or perch, a great 4 pound test fluorocarbon line will serve you well. 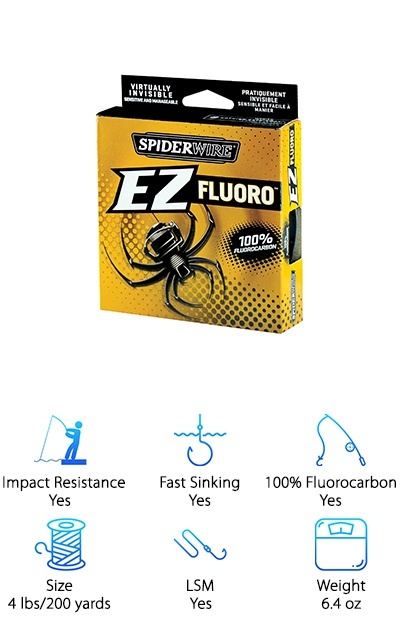 We recommend this SpiderWire EZ Fluoro line. It’s a 100% fluorocarbon line that handles like a monofilament. The best of both worlds! It won’t absorb water and will maintain its integrity no matter how long you have it submerged in water. It has a fast sink time and low spool memory, just like other fluorocarbons. One thing that’s pretty awesome about this line is the low stretch. It makes it a long more sensitive and easier to tell when you've got a nibble. And here’s the kicker: it’s invisible underwater. This means the fish won’t see it and you have a better chance of reeling in the perfect perch. This choice for best fluorocarbon line for baitcasters comes in a lot of sizes - everywhere from 2 - 80 pounds in 25 yards. There’s a lot of good with this line. Like, it has amazing abrasion resistance. It’s strong and great for dragging bait along the bottom of the lake. It also has UV resistance. What does that mean? No matter how long you spend out in the sun, it won’t affect the strength of this line. Plus, it doesn’t absorb water. It’s high density which help it sink fast. But that doesn’t mean it’s not sensitive - it is! You’ll be able to feel when your bait has hit bottom or when you get a little nibble. That’s not all. It also has impressive knot strength and can even tolerate cold weather. 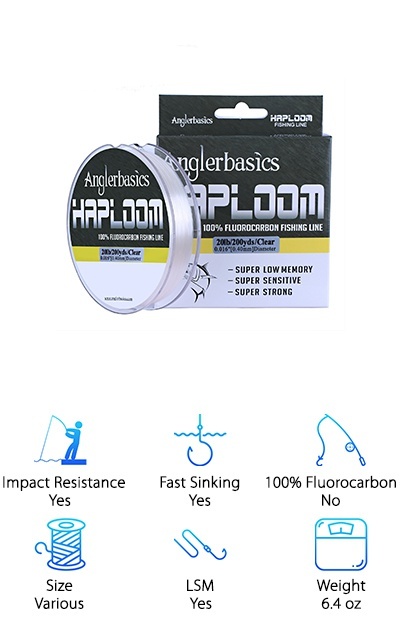 For another all-around amazing performer, check out this coated fluorocarbon line from Anglerbasics. First of all, it’s really resistant to abrasions. And - here’s a little hint - if you wet the line before you tie, your knots will end up with amazing strength. It’s practically invisible underwater so it won’t spook away the fish you’re trying to catch. It’s also really sensitive but still stands up to wind well. What does that mean? Your casting will be more precise. It’s also UV resistant so you won’t have to worry about sun damage no matter how long you’re on the water. This one’s available in a range of sizes, too, from 4 - 20 pound in 200 yard spools. Use it in a 15 - 20 pound test and it’s the best fluorocarbon line for bass. Stren Fluorocast calls itself “the smooth casting fluorocarbon” and, well, we have to agree. It’s pretty awesome in general and casts just like a monofilament line. Casting is definitely not all it has to offer, though. It’s a dense line that helps it sink fast. Maybe you’re wondering how that helps you catch fish. Well, it gets your cast right to the hot zone and then allows your lure to run deep. It’s surprisingly sensitive and practically invisible to fish. Plus, it has impressive knot strength. It’s available in 100 and 200 yard lengths and ranges from 4 - 17 pound tests. In fact, if you use a 6 pound test, we’re willing to be this is the best fluorocarbon line for trout. Heck, we’d even say it’s the best trout fishing line for spinning reels. 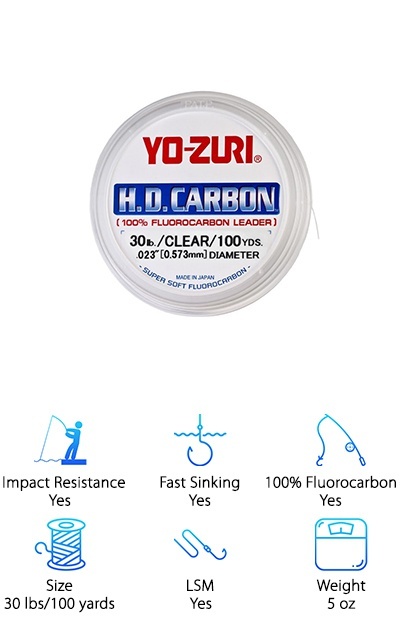 Another fluorocarbon line with a lot of different size options, you can get this one in 2 - 30 pound tests and it’s available in 400 - 600 yard spools. This is a fluorocarbon coated line. What does that mean? It’s made of a combination co-polymer with a fluorocarbon coating. The combination of these 2 materials makes it stronger than a typical fluorocarbon line. It also adds a bit of stretch and helps it stand up to abrasions and impact. There are a lot of other benefits, too. For starters, it’s practically invisible once it enters water. Because of the fluorocarbon coating, it doesn’t absorb water. One more thing: Because it’s made of a combination of materials, you get the same rated pound test for a much smaller diameter than you’d get with other lines. Yo-Zuri H.D. Carbon Fluorocarbon Leader is a pretty advanced line. It made of HD Carbon. What do we mean by that? 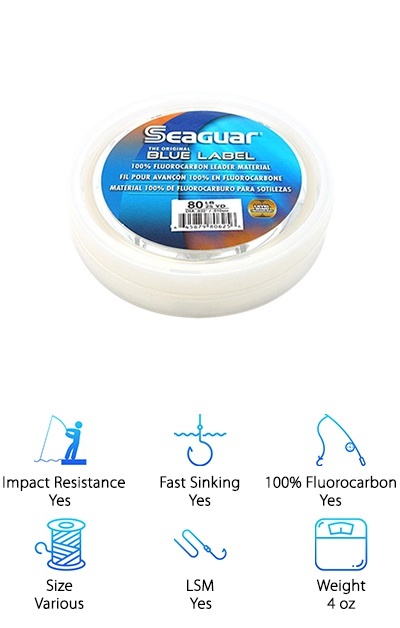 It’s an enhanced fluorocarbon that is designed to be virtually invisible in the water. What’s so special about it? Get this - it’s tinted pink. Now, maybe you wouldn’t have thought that this would make a huge difference, but it does. There’s a lot of science behind, but it boils down to this: pink disappears easy in water. So, if your line gets kinked or scraped, these areas would be really noticeable with a regular fluorocarbon line. With this one, though, it remains invisible. What else does it have to offer? A lot! Superior abrasion resistance, impressive sensitivity, and superb knot strength. Berkley has been in business since 1937. That means they’ve had a long time to perfect when they do and, believe us, they’ve nailed it. This line has high abrasion resistance, a fast sink time, and low visibility in the water. Well, we say “low visibility in water” but that’s actually a bit of an understatement. It’s not just invisible. It doesn’t cast a shadow because - get this - it absorbs the sunlight. You might be thinking that this would damage the line. Nope. It’s also UV resistant so it won’t be harmed by hours spent out in the sun. This line is available in 25 - 50 yard spools and ranges from 4 - 50 pound tests. And here’s the kicker. 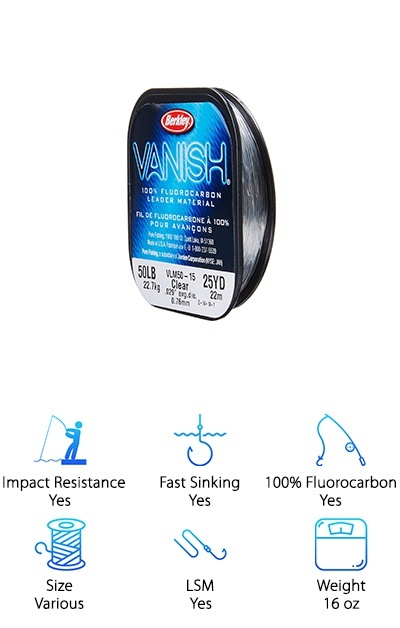 This Vanish line from Berkley is the most flexible fluorocarbon available. Sufix recently improved their Invisiline by improving its castability. Quite frankly, it’s awesome. What did they change? It’s technical, but something about the way that the line is extruded in the manufacturing process. It sits on the spool a little better and stays extra limber. It also has low stretch which allows for optimal hook setting. Despite how tough it is, it still manages to be sensitive so you can always tell when the fish are biting. Another great this is it’s resistant to UV light. This is a feature that’s important when you consider that you’re going to be in the sun the entire time you’re fishing. One more thing: you get a lot of different options here, too, with 100 yard spools available in 4 - 20 pound tests. You can’t get a more appropriate name than KastKing and you won’t find many copolymer fluorocarbon lines that live up to this one. This truly is the cast king. (See what we did there?) Here’s what makes this one so great. It has the best features of a copolymer - low memory and amazing castability. But you also get the fluorocarbon benefits, namely a fast sink time and underwater invisibility. Oh, and it’s also smaller and stronger. What does that mean? You can put more line on the reel and get deeper in the water without losing strength. And it won’t absorb water so you can be sure it will stay nice and strong. 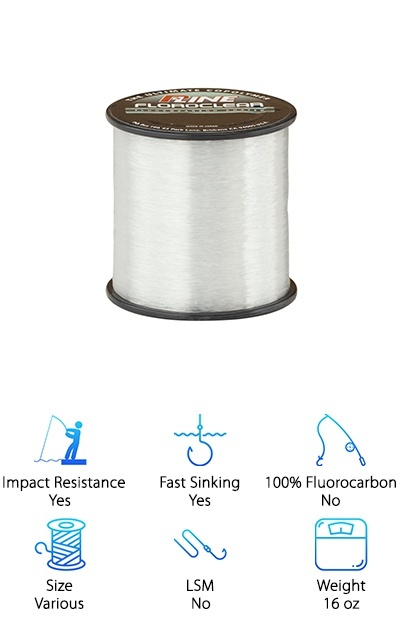 You get 300 yards with this spool but you can choose between 4 - 30 pound tests.